Rodama: a blog of 18th century & Revolutionary French trivia: Was Marie-Antoinette a redhead? 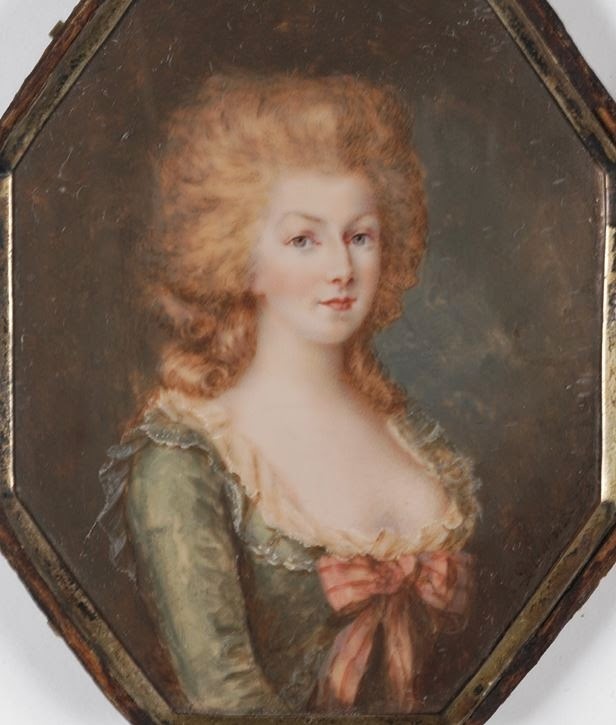 This miniature of Marie-Antoinette represents that irritating internet phenomenon, an image which is endlessly reproduced on Tumblr, Pinterest and various blogs, but with no real information about its provenance. The original post, I think, was the one listed below on the Grand ladies website. The picture is annotated here as "Marie-Antoinette wearing uncolored hair by François Dumont (Boris Wilnitsky)", so we can probably safely conclude that it was a piece sold by the Viennese Fine Art dealer Boris Wilnitsky which has long since disappeared from his website. Dumont usually signed his work, so there is no reason to doubt the ascription. (Boris Wilnitsky has a number of current Dumonts, all informatively documented). Dumont, who was official Court miniaturist from 1786, painted miniature portraits of the Queen over a long period, from about 1777 until almost the end of her life, so presumably he knew what colour her hair was. On the other hand, he himself lived long into the Restoration and his oeuvre is estimated at c.2400 works, so there was bound to be a bit of variation in quality. 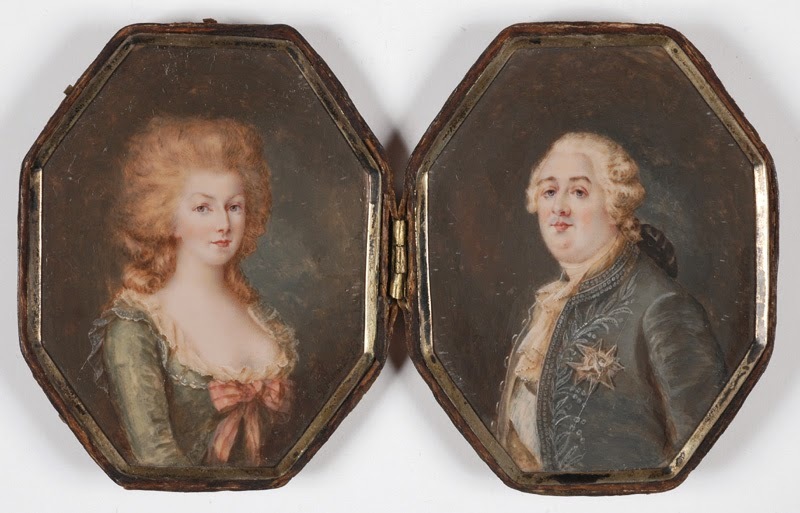 The Louis XVI, though realistically chubby, is not particularly convincing. I suspect the thickness and redness of Marie-Antoinette's hair is exaggerated for aesthetic effect. There are no dimensions on any of the postings but the setting is described as a locket, so I wonder if the portraits are tiny? The very bright red hair, echoed in the skin tones and complemented by dull greens and blues, provides a strong simple palette for a very small scale painting. Generally Dumont repeated the same poses with minor variations in different portraits, but there is nothing else remotely comparable to this picture on the internet, which, apart from the hair colour, is unusual in its informality. The picture remains, therefore, something of a mystery. For relics of Marie-Antoinette's hair, I refer you to the well-informed Cosmos Raminez on Le forum Marie-Antoinette! Thanks. That's interesting - I've come across references to a craze for "Marie-Antoinette coloured hair" but without any information to what colour it was. What is your documentation for the red hair powder? That's a possibility. By most descriptions, however, her natural hair color was strawberry or ash blonde. She did not wear wigs and styled her own hair (as most women did in the 18th century). 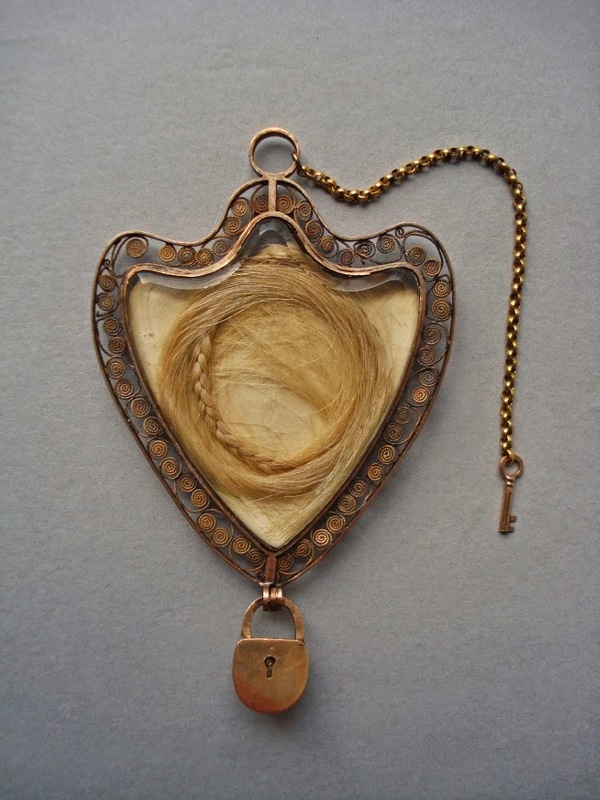 Wealthy and aristocratic women used hair extensions and dyes made from exotic plants and rocks were very popular. Platinum wigs did not exist until the 19th century.